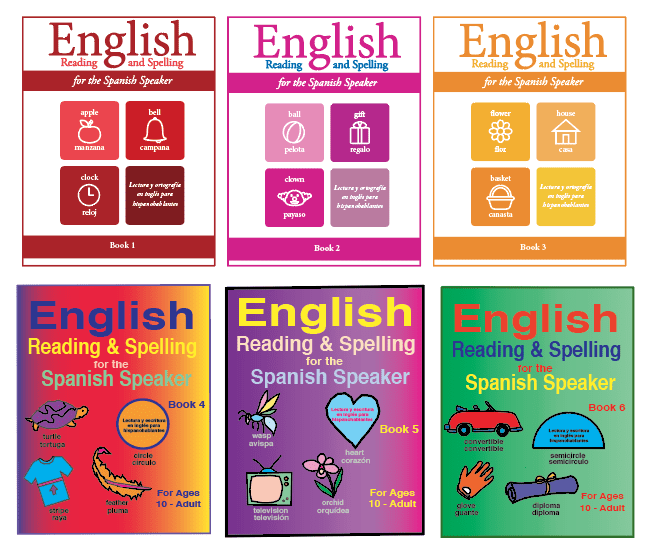 Fisher Hill has a six workbook series called English Reading and Spelling for the Spanish Speaker. This reading and spelling ESL workbook series is for Spanish-speaking teens and adults. The six workbooks were written to help Spanish speakers learn to read and spell in English. The workbooks use Orton Gillingham methods to teach reading and spelling. Orton Gillingham uses a very systematic, structured, explicit, and multisensory approach to teach the forty-four English speech sounds to read and spell. The workbooks provide practice with phonemic awareness, which is the ability to identify individual sounds and their order within words. Learning the different speech sounds will help students read and spell in English fluently. Eighty-five percent (85%) of words in English are phonetic. The workbooks also present many of the commonly used words, called sight words, that are not phonetic. The workbooks are bilingual since the word list for each lesson is presented in English and Spanish. There are pictures to go with many of the words in the lists. Each lesson emphasizes one or two new speech sounds. The vowel sounds in English are different than those in Spanish, but many of the English consonant sounds are similar to those in Spanish. Most consonants in English have one sound. Vowels can make several speech sounds. Sometimes the letter “y” is used as a vowel. Words are made up of syllables (units of pronunciation). Some words have one syllable, others have two or more syllables. Every syllable must have a vowel sound. If a word has three syllables then it has three vowel sounds. On our website, there are placement tests to determine which level a student should begin. A student needs a score of 80% on the placement test to go to the next level. For example, if a student gets 60% on the placement test for level one, then that student needs to begin with level one with English Reading and Spelling for the Spanish Speaker Book 1. Each level begins with the Reading and Spelling workbook. These placement tests can be found under Teacher Resources on our website www.Fisher-Hill.com. Teacher Resources can be found on the top tool bar. Click on Teacher Resources, then click on Reading and Spelling. Then scroll down to the placement tests. The placement tests are called Sound Spelling Placement Test Book 1 and so forth. Sound Spelling Placement Test Book 1 is for level one. The Sound Spelling Placement Tests are spelling tests to determine if a student has mastered the sounds for that level. The teacher or volunteer gives the spelling test to the student. There are also student test forms under Teacher Resources. There are other teacher resources for these reading and spelling ESL workbooks on our website. There is a Scope and Sequence to help you use the series. There are Word and Sentence Practice pages and Word Chains to help with fluency. Visit us on line at www.Fisher-Hill.com to learn more about our English Reading and Spelling for Spanish Speakerworkbooks which are part of our English literacy program for Spanish-speaking teens and adults.